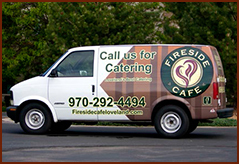 Serving your catering needs in the Fort Collins and Loveland, CO areas. Whether it’s an office meeting with breakfast catering for 10, a formal dinner for 120, a themed reception, or a full-blown company-wide, lunch catering celebration, we guarantee timeliness, affordability, quality, and a 110% effort in supporting your catering needs. Contact us today to start planning. We want to build a relationship with you that will make your catered event even more personal and tailor-made to your needs. Our catering events staff will facilitate the planning, implementation, and execution of your dining experience, including menu offerings, theme creation, food prep, food presentation, and waitstaff. Because we are catering professionals, you can rest assured that no catering detail is too small and nothing is overlooked. Small or large, informal or formal, what has been provided is a framework...a framework with which to build your perfect, worry-free catered experience. By utilizing Fireside's culinary team, the freshest of Colorado’s natural bounty awaits you. For additional information, to arrange a catering planning session, tour our rooms, or just to meet each other...let’s take the next step by having a discussion to determine “What It Would Take” to plan your upcoming catering event. We look forward to meeting with you for a personalized catering planning session to provide you a quote for your special event. Please allow three business days from your catering planning session to receive your written quote. Sorry, no quotes will be given over the phone as we need time to accurately estimate costs and plans for your special event. All quotes are valid for 10 business days. We have a variety of rooms to meet your needs. We can accommodate groups of 10 to 500. 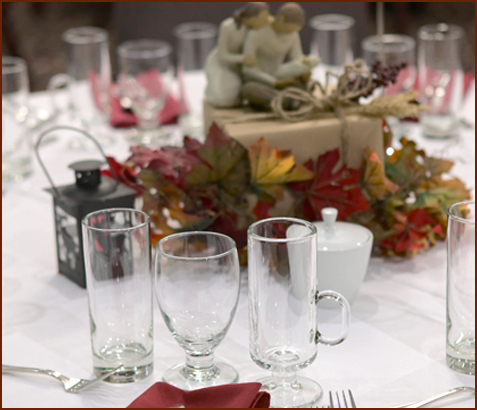 Our catering event staff will help you select the room(s) that best fit your needs. Room charges range from $50-500 during normal business hours of 8 a.m. to 5 p.m. Rates for after-hours events or non-profit organizations are available; please contact us directly for pricing. The room rate includes set-up and tear-down for your event, appropriate table linens, Wi-Fi access, and an easel board with paper pad. Since our rooms are multi-functional, a majority of them have audio-visual capabilities. Audio-visual set up and assistance is available for an additional fee. We pride ourselves on providing you with the best catering experience possible. That’s why we believe there should be no hidden fees. A service charge of 20% will be added to all catering events (room charge is excluded). Delivery or Catering to Go? Not a problem. For delivery service within Loveland city limits, the fee is $25.00; for Fort Collins or Longmont, it’s $45.00. If your event is outside our delivery service area, we can prepare your catering order so that you can just stop in and pick it up. It’s so easy—we’ll take care of the food so you can enjoy your event!